One of the courses I was most excited to play was the Old American Golf Club. Having played so many different styles of courses over the years I'd never played a courses that was modelled after the "Classic American Designs" of the era from about 1910 to about 1937. A period where golf designers like A.W. Tillinghast, Seth Raynor, Donald Ross, and Perry Maxwell were working their design magic on land that would become courses like Shinnecock, National Golf Links, Maidstone, Pinehurst, and Prairie Dunes. Tripp Davis and Justin Leonard did a beautiful job at Old American using the inspiration of these "Classic" designers. In 2010 the railroad bridge in the background was brought to the Old American Golf course from the Red River about 100 miles away. The bridge was built in 1900. A great backdrop on the second hole. 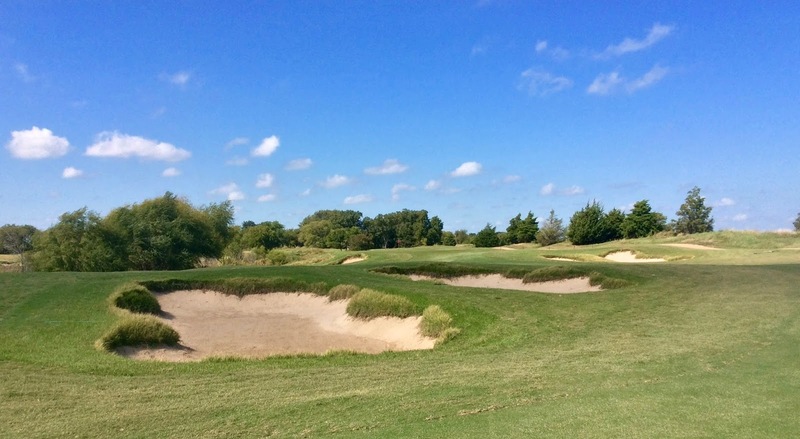 The Old American includes many natural bunkers that have a variety of native grasses. They are scattered throughout the layout and are sometimes quite difficult to get out of, so often its best to not play the hero and just get out the easiest way available. You're really treated well at Old American with complementary drinks and snacks provided at two fully stocked comfort stations on the golf course. The day we played Alex made some great Bloody Marys a perfect drink for a round at Old American. Whether your in one of the bunkers or in some of the native rough, most approach shots will have you playing positional golf. Davis and Leonard's design wants you to use strategy in your shot selection. 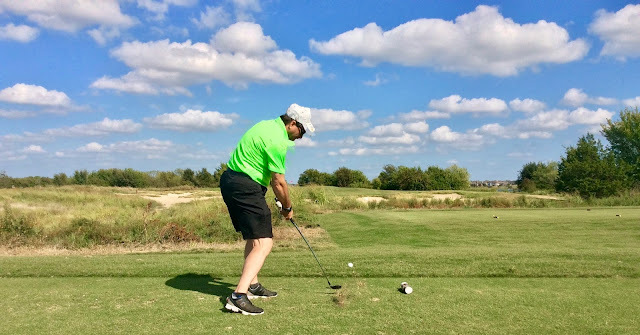 As you can see from my pictures Old American is quite a beautiful and picturesque golf course as it winds around Lake Lewisville. 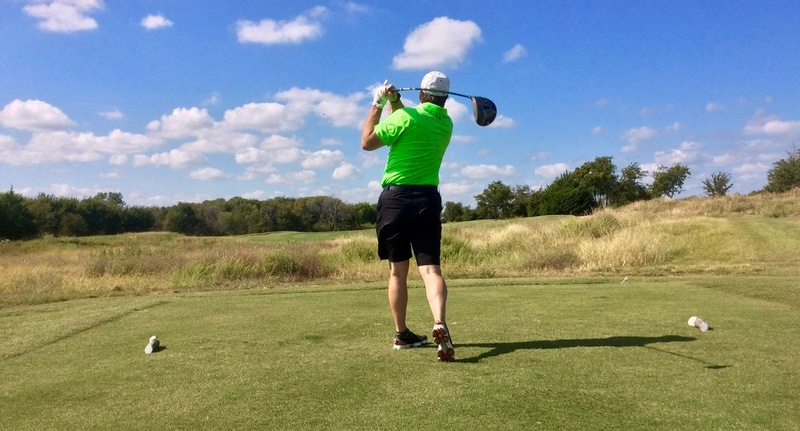 The day we played Old American the wind was quite strong like most days I imagine in Texas. So strategy where to place the ball and club selection definitely entered into our minds during the round. At Old American all bunkers are considered waste bunkers, so they are truly hazards. 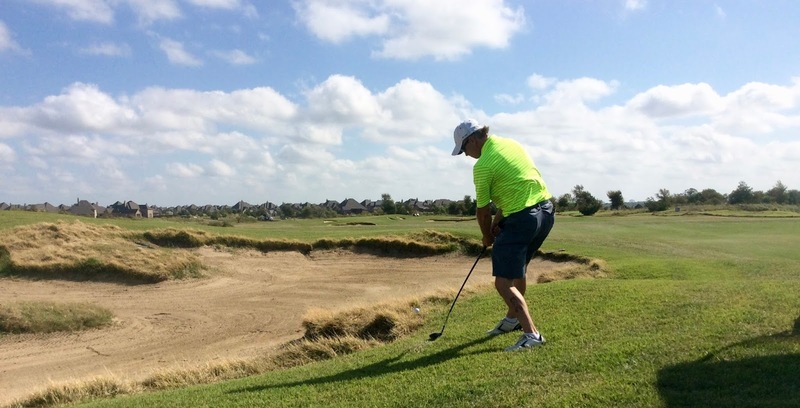 Golfers are allowed to rake when finished in any bunker. 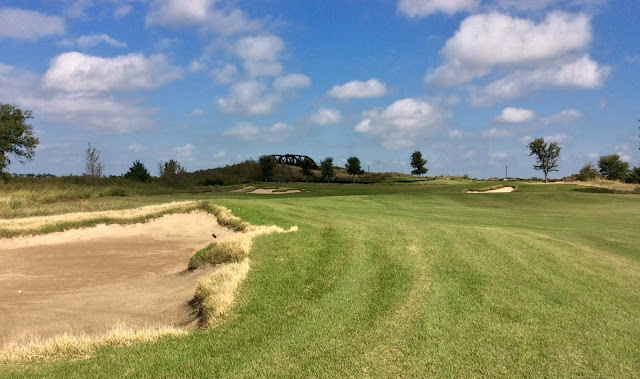 The par 3s are challenging at Old American and will leaving you guessing at club selection especially with the Texas wind. Native grass and bunkers make for a picturesque view on every hole. Love the old school pin and flag another homage to the old "Classic" designs. Old American is a must play when in you're in the Dallas/Fort Forth area. Plans are already underway for the 2nd Annual Dallas Invitational and Old American is a stand out to return for 2017. Green fees run at $150 on weekdays and $175 on weekends, which is on the high end side but well worth the "classic design", amazing customer service and Texas Golf experience.